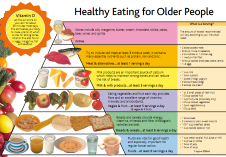 The healthy food pyramid for older people is shown in this image. Click the image for a larger version. getting enough nutrients and vitamins even though older people might not need to eat as much. If you use salt, use iodised salt. See How to reduce your salt intake. Milk does not cause mucus. Keep drinking milk if you have a cold or the flu. Some herbal therapies can interact with medications. Let your doctor or pharmacist know if you are taking these. Brush your teeth morning and night. Use a soft toothbrush and fluoride toothpaste. Swish and spit but don’t rinse. Eggs are nutritious and easy to eat. You can eat them regularly. Long-life and powdered milk are much more convenient than fresh milk and are just as nutritious. Cheese does not cause constipation. Lack of fibre, fluid and activity do! Canned, frozen or refrigerated meals (such as soups, stews, baked beans) are easy and can be nutritious. It's OK to have one or two alcoholic drinks a day, and some people enjoy having a drink with their main meal. But remember to have at least two alcohol-free days each week. If you are on any medication, check with your doctor or pharmacist before drinking alcohol. Being overweight or underweight increases your risk of developing health problems. Tell your doctor if you are losing or gaining weight without trying. Canned and frozen fruit and vegetables are just as nutritious as fresh varieties. Choose foods canned in water rather than oil, brine or syrup. Aim to be physically active for at least 30 minutes most days. Choose activities you enjoy, like walking, golf, bowls, dancing, tennis and tai chi. Active work around the house and garden also counts as physical activity if it gets you out of breath or sweaty. This booklet has advice about healthy food choices, alcohol and physical activity for older people. Written by Healthy Eating, Healthy Ageing project, Older Persons Health and Rehabilitation (OPH&R), Canterbury District Health Board. Endorsed by HealthInfo clinical advisers. Last reviewed October 2018. Older Persons Health Service. Healthy eating for older people. Canterbury District Health Board. November 2011. Ref: NUT 0128.